Compensate for nutritional deficiencies to reverse the logic of cellular aging. *Regenerate and revitalize the skin s cellular activity. *Restore the skin s comfort and suppleness with essential fatty acids. *Bring out the complexion s radiance and youthful glow. Cellular life complex with 56 active ingredients boosts the cellular activity of the skin. ATP and Actinergie stimulate inactive skin cells giving them renewed energy. 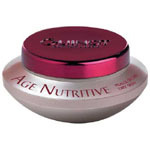 Nutrinergie which contains Omega 3 and 6 restores the skins, suppleness and radiance.